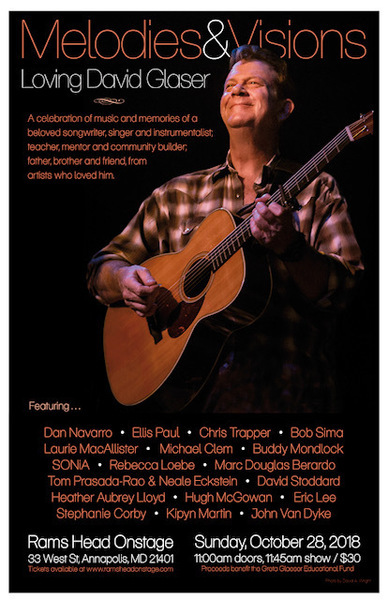 For the past few months, we've worked diligently to assemble a stellar lineup of nationally-based singer-songwriters to pay musical tribute to our sadly departed friend, David Glaser. It happens Sunday October 28 at 11am the Rams Head On Stage in Annaplis MD (David's hometown), and the lineup is as sweet as can be -- Dan Navarro, Ellis Paul, Chris Trapper, Bob Sima, Laurie MacAllister(of Red Molly), Michael Clem (of Eddie From Ohio), Buddy Mondlock, SONiA (of disappear fear), Rebecca Loebe, Marc Douglas Berardo, Tom Prasada-Rao& Neale Eckstein, Heather Aubrey Lloyd, Eric Lee, David Stoddard, Hugh McGowan, Stephanie Corby, Kipyn Martin and John Van Dyke. Some tickets still remain, but it is selling out fast. So hurry and grab seats to what will be a richly heartwarming and uplifting event. Photo by David A. Wright.